Here at RRRUFF! 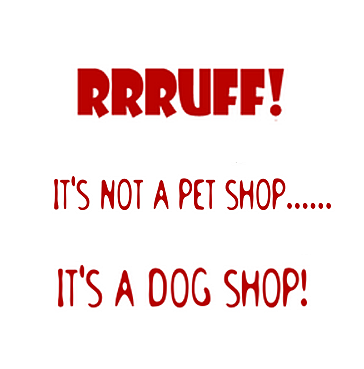 we're not a pet shop, we are a dog shop. We have every type of dog bed you could ever need, we have Big dog supermats even Molded outdoor dog beds. We have lots of sturdy and fun dog toys to keep your dog amused, a wide choice of accessories that you may need, and breed specific gifts for the dog lover. We have great dog collars, leads and even a bit of bling bling for tiny dogs up to the biggest. We want our dogs to be comfy and nothing makes a dog more comfortable than a coat or harness that fits perfectly, so be sure to check out our perfect measuring guide. No dog owner has reached their true fanatical height until they own a copy of dogopoly. and we have 15 breeds to choose from, just one of the many great dog gifts we have in stock. To inquire about our services or order our products, please call us at the shop or send a message.